I woke in the warm air of the wall tent. The heavy canvas fabric blocked all signs of daylight, and it was hard to convince myself it was morning. My sleeping bag hood remained frost free, an unexpected luxury that made getting out of my sleeping bag much more pleasant. I left the wall tent and found a deserted parking lot. Where dozens of cars and dog trucks and trailers had sat arrayed the night before were lonely clumps of straw. Last night, dogs had laid in thepiles to keep warm during their layover, but no the dogs were long gone. Some–the 8-dog sprint teams–may even bee nearing the end of their race. The 14-dog marathon teams would be approaching halfway. Without the abandoned straw and still-smoldering bonfire remnants, I could have easily doubted that this snow-covered gravel lot had just served as a checkpoint in the 373-mile John Beargrease Sled Dog Marathon. We’d stayed overnight at the Two Harbors Highway 2 Checkpoint, where we volunteered as official time keepers. Thirty-five miles from the race’s start in Duluth, Highway 2 is the first checkpoint. 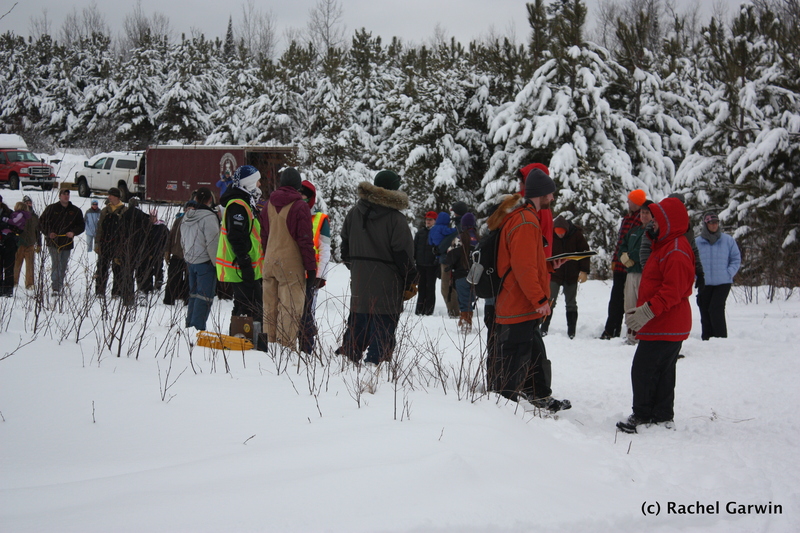 Forty-one teams were scheduled to pass through during the afternoon and evening on their way north toward Tofte and Grand Marais. 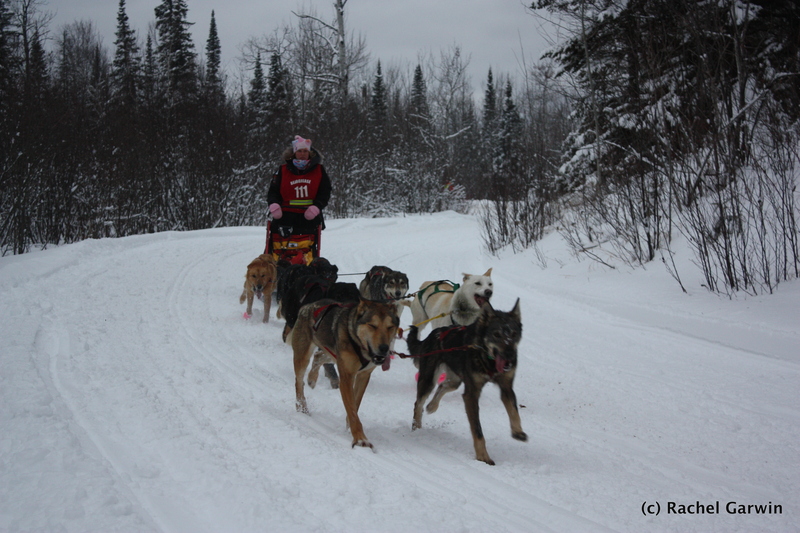 Most mushers stopped at the checkpoint, fed and souped their dogs, and rested starting the next 35 miles to Beaver Bay (or 38 miles to Finland, for the sprinters). A couple of teams skipped Highway 2, opting instead to rest at a later checkpoint. All marathon teams, however, were required to rest for 28 total hours; the sprinters needed to rest at least 8 hours. Volunteers, handlers, and spectators mill about the chute before the first teams come in. Volunteers and spectators milled around the parking lot in mid-afternoon grayness. Temperatures hovered in the low 30s, and the wet snow clung to my pants and boots whenever I stepped into a deep spot. Handlers hovered at the mouth of the chute, where their mushers would have to turn their teams to the left to enter the parking lot. Leads, leashes, and lengths of poly rope tied to brass clips hung around the shoulders and waists of the handlers. Race judges wore red Wintergreen anoraks, proudly labeled with their positions. Volunteer dog crews ran around in florescent orange safety vests. Spectators in jeans and snowsuits wandered aimlessly through the chute. We, the official time keepers, just wore our grungy trail clothes. Our only official designations were the binders we carried and the pencils we wore in our hats. The warm, damp afternoon made for slow conditions. The snow on the trail seemed sticky. The first teams–the fourteen-dog marathoners–didn’t appear until 4:30, a full half-hour after the radios crackled that they were on their way to our checkpoint. My fellow spotter and I saw the movement of many short legs and the glide of a sled through the alder thicket along the inside bend of the trail. “Team coming!” We both called to the timekeepers. “14 dogs!” So many dogs, so many wagging tails, so many lolling tongues. 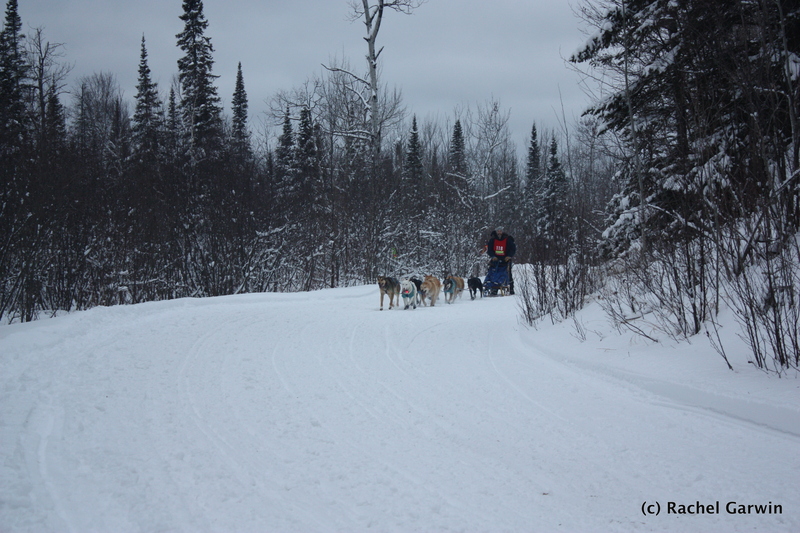 Our spotting job now concluded, it was up to the timekeepers to check in the musher, count his dogs again, and record his checkpoint entry time. The handlers rushed to the gangline and led his dogs to their truck, where food, warm water, and straw waited. The end of the night passed in a flicker of flames and a blur of headlamps. We stood around a waist-high bonfire while we waited for mushers to rest their full four hours. We saw approaching teams as a line of bobbing white lights spearheaded by a blinking red light at the lead dogs’ neckline. The higher white lights hustled along with the dog handlers’ heads, to which the lights were attached by elastic straps. At the fire, we wondered at the mushers’ strategies. Were they waiting for colder weather so the snow would firm up and get faster? The night’s cold was likely better weather for running the dogs, as they overheat much quicker than their human teammates. Perhaps the dogs needed a longer break after their first leg, and now they would better pace themselves. We didn’t know much about it–the racing world felt far from the world of freight and expedition mushing familiar to us. Another bobbing line of lights approached, and I ran to the foot of the chute. 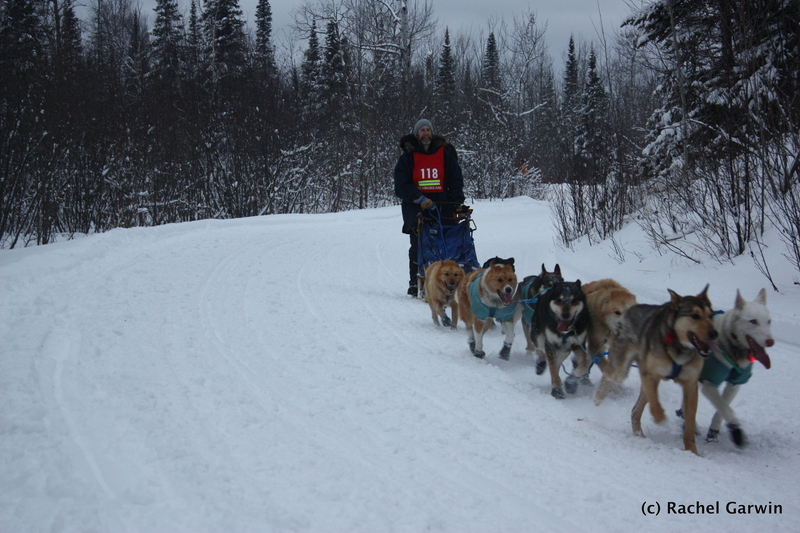 The team made too shallow a turn onto the race trail, and the sled popped over the snowbank at the turn’s inner corner. The musher righted the sled, pressed the snowhook into the snow with his boot, and walked forward to check his dogs. I instinctively moved toward the sled and rested my foot on the hook, a sharp claw at the end of a rope tied to the dogs’ gangline. An eager dog team can pull an unweighted snowhook out of the snow, transforming it into a dangerous projectile. The race official’s eyes twinkled in my headlamp beam. “Good girl,” he said appreciatively. Despite the gulf between the expedition and racing worlds, I guess I’d absorbed enough to no longer seem a novice.